AH: So what is “Beyond the Arena”? DC: Beyond the Arena is my heart and soul! I partner with horses to assist people in personal growth and emotional healing utilizing the Equine Gestalt Coaching MethodTM. We hold one-on-one sessions as well as workshops at a beautiful 35 acre ranch with an indoor arena in Larkspur Colorado, roughly 45 minutes from Denver. I also offer Skype consultation for those who can’t make it to the arena. Our clients have the opportunity to bond with a horse and explore the process of how they relate to others and themselves in an experiential setting. The horse’s interaction and feedback combined with positive coaching, body awareness guidance and Gestalt methodology assists the client in examining her life and choices made with a focus on designing a positive future. It’s an amazing process and people don’t forget what they learn from a 1,200 pound animal! I work primarily with women. The majority of my clients are adults but I also work with teens as young as 14. The learning and healing process takes place in the present moment and there is no formal agenda (horses don’t wear a watch when they are working!) We process issues that arise such as self-esteem, body image, confidence and communication. So speaking as a city girl who may be a bit apprehensive about your “partners” in this process – why horses? Oh – it’s important to note that there is no horse experience necessary! Horses are prey animals (as opposed to predators) – They are particularly sensitive to people’s energy and body language. They can pick up subtle signs that we as humans are not as in tune with. It’s an attribute that helps them survive in the wild. They can sense an incongruity in how a person is presenting themselves and the type of energy they give off. Horses give me “equi-feedback” as the coach and they will react in a myriad of ways. We can use the horse’s response as a way to increase the individual’s self-awareness. The horse is a non-judgmental being that can’t lie. They give honest feedback and encourage us to be authentic at all times. They are great lie-detectors and will bust someone who is trying to be anything otherwise…you can’t fool a horse. Example) If someone has a smile plastered on their face but is miserable inside, a horse can sense that in a second! Often it is only once the client is open, authentic and grounded (and their energy field softens) that the horse chooses to join up with them. 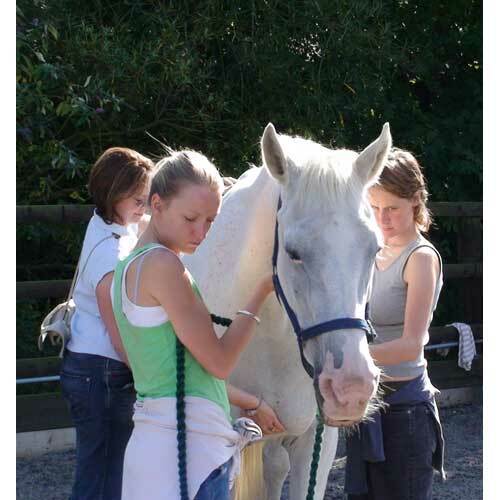 How did you get involved in equine Gestalt coaching, and particularly the youth programming? I had an eating disorder myself as a teenager, and I dealt with depression and low self-esteem. I didn’t have a support system or a female mentor to offer wisdom without judgment. There simply aren’t many programs out there where people are reaching out to offer these young women a hand up. At “Beyond the Arena”, we offer this supportive and inspiring environment for teenagers and women, and they are able to practice positive behaviors through interactions with the horses. How do your participants find out about your programs? Are they actively looking for equine therapy? I’m often referred to by therapists, and I also serve as a facilitator with the Eating Disorder Foundation of Denver. I am starting to get direct inquiries from my website as well. 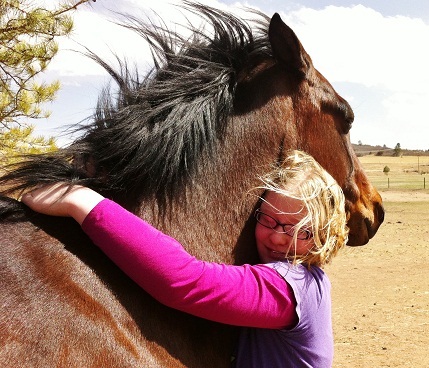 Equine therapy/coaching is considered a supplemental mode of support but traditional treatment centers are increasingly seeing animal-assisted therapy/coaching as a powerful complement to other treatment options. What is the desired outcome from the work you do? My mission is to inspire women so they can connect with each other in a supportive, healing environment, starting at a young age. Often women tend to wait until they are older before looking into self-care. I aim to start with the younger generation to empower women and encourage them to carry their passions into the world. Beyond the Arena is still a relatively new company. How do you see it progressing? I would love for equine Gestalt coaching to be recognized as more mainstream and more readily accepted as a healing/empowering modality. I hope to be able to partner with schools and offer a life-skill building curriculum with horses. Beyond youth programming, I hope that Beyond the Arena will also eventually become a major referral hub for people when they get out of treatment centers. You’re a successful woman – what helped you find your path and what advice would you give for other young women? There is a lot of trial and error! Young women need to listen to their intuition and inner voice, which is not a skill that’s cultivated among most young people. I found my path in a supportive, healing environment with like-minded people that catered to allowing self-discovery. We each need to trust ourselves and our own innate wisdom, follow our intuition, speak our truth and not care about what others think. By looking within and through the self-discovery process, we can identify what is holding us back, and then move beyond. To learn more about Devon and her company Beyond the Arena, visit www.beyondthearena.com. Devon can also be contacted via Facebook and Twitter.